A gyártó kifejezetten igényes, nagy felbontású fényeléshez ajánlja Canon Log, ASC CDL, 1D/3D LUT támogatással. A HD és 2k megjelenítés során 3 különböző felkonvertálási eljárás közül lehet kiválasztani az adott képtartalomhoz leginkább megfelelőt. A színleképzéshez az ismert szabványok közül minden fontosabb beállítható: DCI-P3, ITU-R BT.709, EBU, SMPTE-C és Adobe RGB. Az IPS LED panel felbontása 4096 x 2560 pixel vagyis 16:10 képarányú. Így a videó, filmes munkák mellett grafikusok és fotósok is használhatják. További információ alább és a gyártó honlapján. Canon has announced its entry into the production display market with the launch of the DP-V3010 – a 30-inch reference display specifically designed for colour grading and high quality 4K video production. Reinforcing Canon’s continued commitment to the broadcast and cinema industries, the new DP-V3010, together with Canon’s Cinema EOS System, offers a first-class input-to-output solution for 4K digital cinema and wider video production workflows. With a technical specification designed to provide repeatable, accurate output, the DP-V3010 is optimised for use in scenarios such as colour grading, where overall image quality and consistency are of paramount importance. Its ability to natively display high resolution 4K images and a range of colour options means that the DP-V3010 is also well suited for use on-set or on location, and for other digital imaging tasks including CGI work, Computer Aided Design and 3D animation. The DP-V3010 has been designed to deliver stunning 4K resolution alongside astonishing accuracy in colour reproduction, even between multiple displays. The display is powered by a custom-developed image processor designed and manufactured by Canon, which combines with an RGB LED backlight system and IPS LCD panel to provide highly consistent quality and colour, both on-set during shooting and in post-production editing suites. Utilising Canon’s unrivalled heritage in the development of imaging technologies, the DP-V3010’s image processor helps to ensure consistent brightness and colour, for a high level of uniformity across the full screen. A 10-bit panel driver works with the processor to enable the display of 1,024 gradation levels for each RGB colour, allowing delivery of exceptionally smooth and accurate gradation characteristics across all content types. As a result, the display provides the faithful colour-reproduction capabilities required for colour grading – providing an alternative to a dedicated DCI-compliant projector in post-production. The DP-V3010’s RGB LED backlight system enables the reproduction of a rich array of colours. 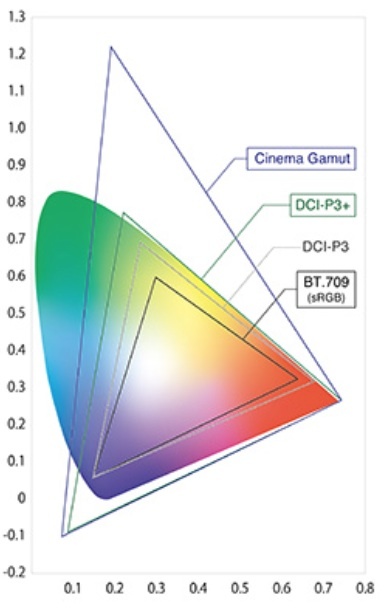 Combined with the IPS LCD panel, the display supports the most commonly used cinema colour space, DCI-P31, as well as the colour gamut specifications of various broadcast standards (ITU-R BT.709, EBU and SMPTE-C) and the Adobe RGB colour space2. At 30-inches, it is designed for desktop or wall installation in editing rooms and studios, making it ideally suited for video editing, colour grading, special effects, and to support the advanced needs of 4K digital cinema production. 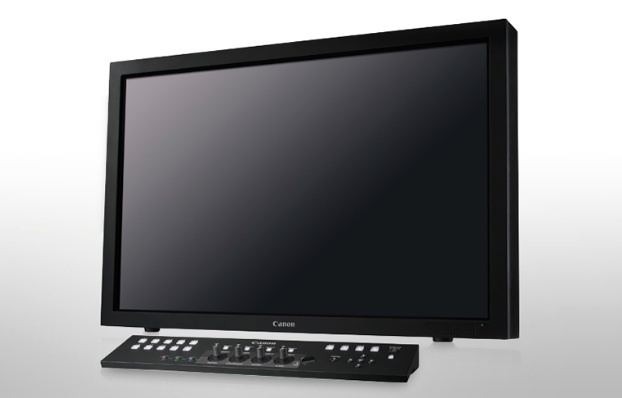 At 30-inches, the DP-V3010 is designed for desktop or wall installation in editing rooms and studios. The IPS LCD panel features a resolution of 4,096 x 2,560 pixels, enabling the display of native DCI 4K resolution (4,096 x 2,160 pixels) without image scaling. The display is also suited to PC-based editing tasks, such as high-resolution still-image processing and visual-effects production work, thanks to a panel aspect ratio of 16:10. Furthermore, Canon’s image-processing technology, combined with the high-contrast IPS LCD panel, achieves a contrast ratio of more than 2000:1, the minimum recommended by the Society of Motion Picture and Television Engineers (SMPTE) for digital cinema post-production work3. Ensuring the accurate display of night-time shots and other dark scenes, the display accurately reproduces gradation in dark areas of an image – an important factor in digital cinema production. The DP-V3010 also supports a wide angle of view thanks to minimal changes in colour and contrast across the IPS LCD panel – offering a highly effective solution in editing rooms or settings where multiple users wish to check image quality. Equipped with a dedicated picture mode that supports Canon Log Gamma4, the DP-V3010 enables conversion of footage shot using Cinema EOS System cameras into images suitable for monitoring on set. In addition to support for the cinema standard frame rate, 24p, the new Canon display accepts a wide variety of 4K video input signals from 23.98p to 60p, including the 50p frame rate more common in EMEA broadcast productions. Support for the ASC CDL5 metadata format and 1D/3D-LookUp Tables (LUTs) allows accurate colour matching either on set or in the grading suite. To guarantee high levels of reliability, the DP-V3010 undergoes precise colour adjustment prior to shipment. An advanced system monitors temperature and brightness and uses the information to automatically correct backlight colour and brightness over time – ensuring highly stable display performance. The DP-V3010 includes a control unit that facilitates intuitive operation through its straightforward layout, and can be used on a desktop or installed in a standard 19-inch (approx. 483 mm) equipment rack. Operability and maintenance are further enhanced by support for calibration of white balance, brightness, colour temperature, colour gamut and gamma without the need for a PC, when a compatible third-party sensor is used. The DP-V3010 is expected to be available in Europe in Q1, 2014. Posted in ÁltalánosTagged 4k, Canon, DP-V3010Bookmark the permalink.